Here lately I’ve been showing my readers how to interchange outfits with different looks just by changing a piece or two. Today I’m wearing the colored denim trend but couldn’t figure out if I wanted to color-block it or wear animal print with them, so I’m showing both styles of how to wear colored denim. I have been waiting to wear these greenish colored skinny jeans since earlier this summer but it was just too darn hot for long jeans. But today is rather pleasant outside so I threw them on. For my first look I paired the jeans with an animal print shirt and red belt. It probably would have looked better with red pumps but can you believe it, I don’t own a pair of red pumps. (I must put them on my Birthday list for next month). For my second look, I went for a colorblocked theme. 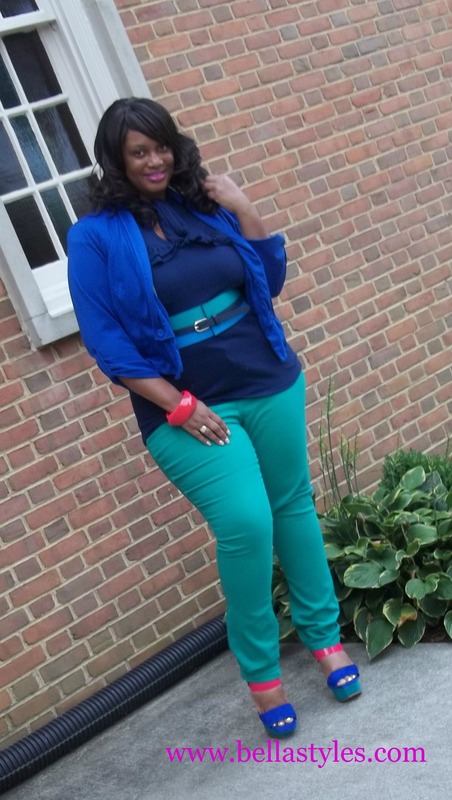 So I’m wearing a navy shirt, blue jacket and a colorblocked belt with both of those hues in it. I added just a pink bracelet to bring out the pink that’s in the pumps.